The faculty of the Department of Chemical Engineering have awarded Scott Danielsen the Schlinger Fellowship for Excellence in Chemical Engineering Research for the period 2018-19, as evidenced by publications, submitted manuscripts or other measures of impact. 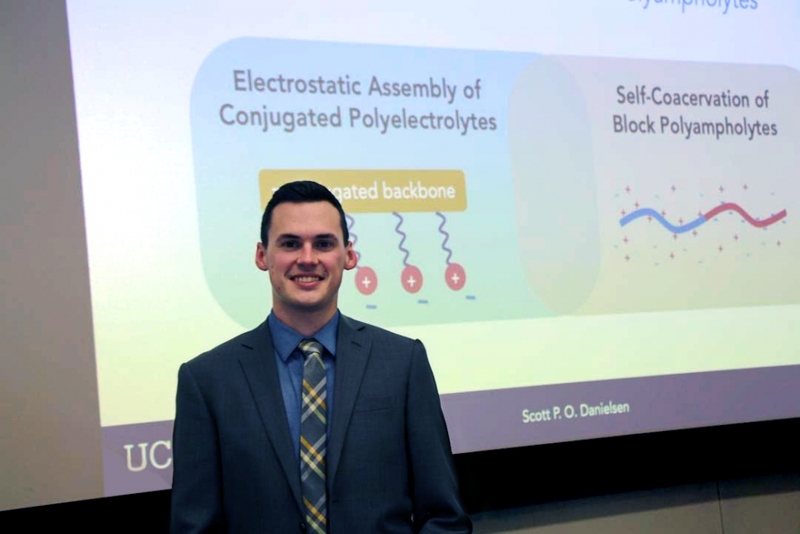 “Congratulations to Scott on his outstanding application package and performance in our graduate program," said M. Scott Shell, Department of Chemical Engineering Professor and Vice Chair for Graduate Education. The Schlinger Fellowship acknowledgement is an honor for Danielsen, whose speculative research approach worked on a number of high-risk problems in relatively unexplored areas. Danielsen is part of the Segalman and Fredrickson Labs, and was a Best Talks winner at the 11th Annual Clorox-Amgen Graduate Student Symposium held on October 8, 2018. His current research focus is on the assembly of charge-containing polymers in aqueous solutions – understanding the balance of charge – charge interactions and excluded volume interactions on their thermodynamics and structure. “A central element to this work has been on coacervation, a liquid–liquid phase separation, using theoretical approaches to study polyampholytes including biomacromolecules, such as intrinsically disordered proteins, as well as applying the resulting dense liquid phase as inks in the roll-to-roll printing of organic semiconductors,” Danielsen shared. 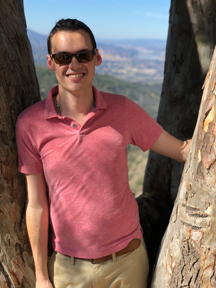 One of the more challenging aspects of his research is describing to a general audience how two seemingly disconnected topics – organic semiconductors and intrinsically disordered proteins – can actually be intimately connected and approached as a cohesive research question. The Segalman Group researches structural control over soft matter on a molecular through nanoscopic lengthscale, which is a vital tool to optimize properties for applications ranging from energy to biomaterials. The Segalman Group works to both understand the effects of structure on properties and gain pattern control in these inherently multidimensional problems, with a particular interest in materials for energy applications such as water filtration membranes, batteries, and thermoelectrics. 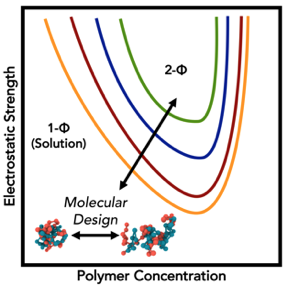 The Fredrickson Group conducts a broad range of research activities in theoretical and computational polymer science, many of these aimed at understanding self-assembling polymers and complex fluids, and especially block copolymer systems. A computational tool that is unique to the group is the “Field-Theoretic Simulation” technique, which is a numerical procedure for simulating statistical field theory models of complex polymer formulations. The group also maintains strong interactions with experimental teams in academia and industry throughout the world. Danielsen reminds incoming Chemical Engineering graduate students that a PhD is hard work, but that it’s also important to prioritize well-being. Spending time in Santa Barbara has also taught Danielsen to appreciate a fine glass of wine. “With so many beautiful vineyards out in the Santa Ynez Valley and fun pouring rooms in town, a tasting flight is a great opportunity to de-stress on a Saturday afternoon,” he said. Danielsen will start the new year in the Department of Mechanical Engineering and Materials Science at the Pratt School of Engineering, Duke University, to begin a post-doctoral associate position with Michael Rubinstein, where his research “will center on the theoretical prediction of mechanical properties of various polymeric systems with a focus on assemblies of biological polymers,” Danielsen detailed. The applications for the fellowship were extremely impressive, and all of the applicants represented Chemical Engineering at the highest level of performance.